Note that these operations are not terribly difficult to implement efficiently. For example, the first three operations can be implemented directly by using a , so they can be implemented in constant expected time using the hash tables discussed in Chapter 5. 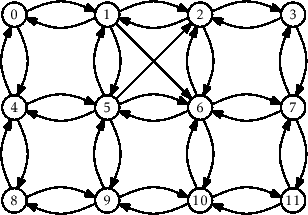 The last two operations can be implemented in constant time by storing, for each vertex, a list of its adjacent vertices.